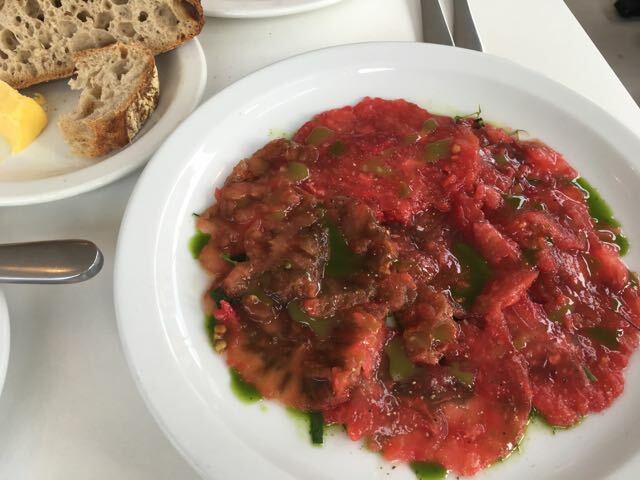 It's late summer and you see a 'Tomato Salad' listed on the menu. How many times has it been a let down? Being presented with some tough-skinned, watery, flavourless sliced fruit happens far too often, and yet still we order in hope. As you can see, there was no such experience at Birch, my favourite restaurant in Bristol and one of my favourites anywhere. Ripe, juicy, herb-dressed and pepped-up with salted green elderberries. Summer's peak. Home-made Sourdough bread, which came with home-made butter, mopped up the juices. 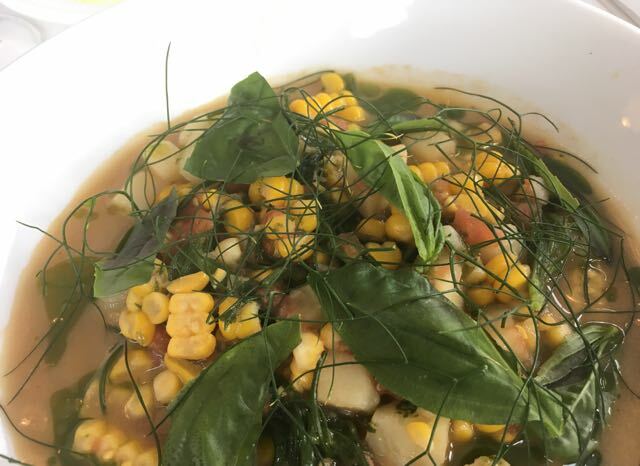 Perfect, and if I could eat this dish every day for the rest of the season I would. Local and seasonal is what Birch is about. True seasonality. No "spring lamb" in March, when well-farmed lambs aren't ready until mid-summer. No out of season peas or broad beans. When ingredients are at their best, they go on the menu. 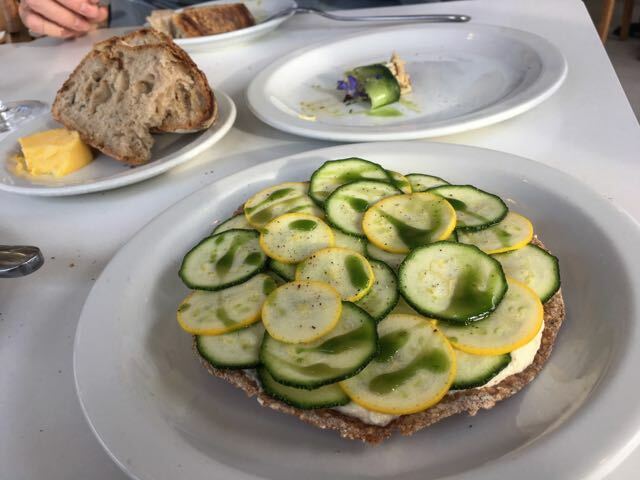 And a great many of those ingredients are grown organically by the restaurant owners, in a three-quarter acre field on the southern fringe of Bristol. Gathered in the morning, prepped in the the kitchen in the afternoon, and on your plate in the evening. Excess bounty is cannily preserved for the leaner months. If they can't grow it, they forage for it and source it from people they know well and trust implicitly. The dedication required shows in plate after plate. 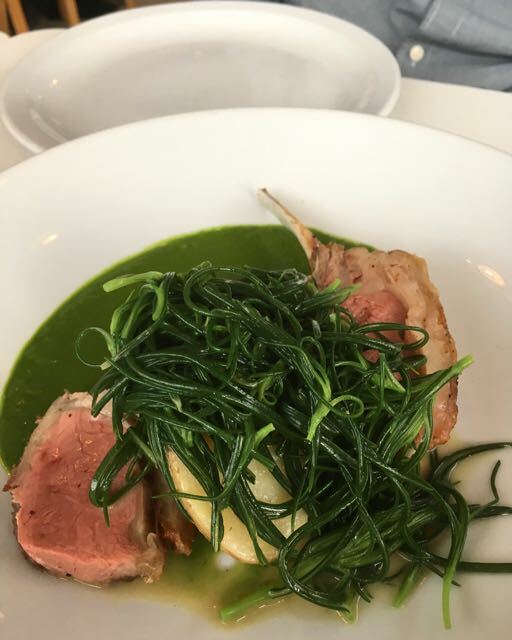 This is a truly ingredient-led restaurant in the hands of owners Sam Leach, in the kitchen, and wife Beccy who runs the most welcoming front-of-house you are ever likely to find. The menu is usually mostly small plates with a couple of mains, a few puddings and a perfectly ripe cheese. I don't live in Bristol but have managed to eat at this little neighbourhood restaurant on a residential street in Southville four times. Each visit has been a joy. Last week we were served that very Tomato Salad with summer herbs and salted elderberries; slices of Air Dried Beef, made in-house, were a superior Bresaola; Sweetcorn and Langoustine broth was deeply fragranced with summer herbs; freshly picked sliced raw courgettes came with a house-made oatcake spread with Westcombe Dairy cow's milk ricotta; Spider crab rolls were rich crabmeat encircled by flavourful ribbons of cucumber topped with borage flowers; a main of Speckled face mutton, served pink, was juicy, tender and full of flavour, and came with the restaurant's lovingly grown monk's beard and a deep-green kale sauce. 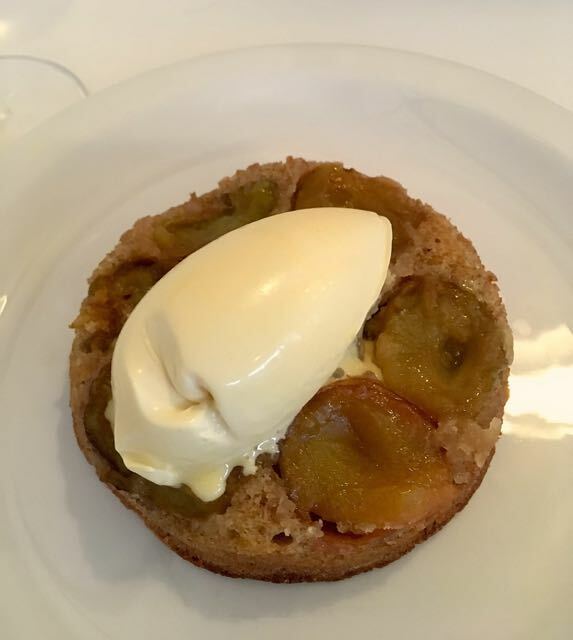 Dessert included a Greengage and Rye pudding with Jersey cream, the rye flour bringing a depth of flavour but no heaviness, a nice pairing with these most luscious of plums. 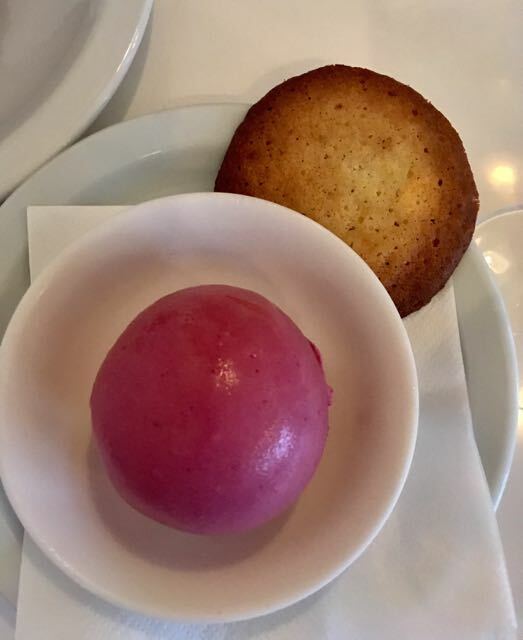 After all that, a Blackcurrant Baked Alaska for 2 was, sadly, out of the question, but a scoop of deeply-flavoured Blackcurrant and yogurt ice cream came with, as you might hope, a crisp buttery biscuit on the side. Prices start at £2.50 for oysters, £6-8.00 for small plates, £14-17.00 for mains and £5.50-7.00 for desserts or cheese. Wine is from suppliers who specialise in low intervention, small domaine, producers. I particularly enjoyed a glass of Les Vignerons d'Estezargues Rhone red for £4.20 and a Henri Lapouble-Laplace Jurancon at £6.00. Cider and Perry drinkers are well catered for, this is the West Country after all. So good to see Birch packed with regular customers on our visit. Do book and cross the Gaol Ferry Bridge to neighbourly Southville.